Thin stones are typically cut easily. The opposite, thick stones, are stones well connected and plenty of eye potential. Thin is a negative quality. Light stones are sacrificed easily. They are unimportant, or difficult to attack as a whole. The opposite, heavy stones are not easily sacrificed, cover a rather important area and are weak despite their number. Light is a positive quality. The misunderstanding perhaps comes from the fact that light stones are usually not thick, since that would make them probably high in number and therefore important. On the other hand, thinness refers to a problem, in that the imminent cut is problematic for both potentially cut off parts, and both are too important to sacrifice, so that they are apparently not light. Timm: My understanding of thin vs. light is that thinness fundamentally refers to a group (a bunch of stones that must remain connected) while the essence of light play is not to create a distrainable group in order to remain very flexible. shows an intention to escape and separate white, but it is thin. The cut at a will separate the black stones, isolating two of them in the corner where they will barely live. Black is not light due to the - exchange: Black has already invested too much in the corner to throw these stones away easily. After , White has the corner and Black's stones are floating. 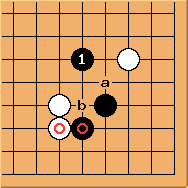 However, due to the miai of a and b, Black will be able to apply some pressure on the outer stones. White cannot easily attack the Black stones on a large scale. Black can therefore treat his stones lightly and play somewhere else.